Meeting was held at Bob Evans Restaurant on Transit Road in Williamsville, New York. Meeting was called to order at 7:33 by President, Pat Zbock. There was no reading of a recent secretary’s report. Treasurer’s report was given by Pat King. Motion to accept by Edwin Sutton and second by Betsy Kubiak. New Business: The reason for the board meeting was to discuss the new By Laws. Chair of the committee, Mark Owens presented a rough draft of the new By Laws. After going through them and discussing each section, the board all agreed to a new set of By Laws. Motion to adjourn the Board meeting by Mark Owens and second by Edwin Sutton at 8:30. The meeting was called to order by Pat Zbock at 8:30. There were 14 adult members in good standing, 1 adult member, 3 youth members and 3 guests present. Newsletter: Update any submissions to Betsy Kubiak before the end of the month. High score: Ann Hertel is the chairman of this. She brought us a set of new forms and stated that they are on the web site. Looking at adding a few new categories into the year end awards. These will be extra awards not division categories. Youth: President, Gabrielle Young and Vice-President Veronica Kucinski presented what the youth are working on. They have drafted up a youth logo, which the board and membership voted to approve. They want to sell t-shirts with the new logo on them. Mark Owens motioned for the youth to spend up to $500 for 100 shirts. The cost of the shirts, printing, set up, tax, and shipping & handling. Motion second by Edwin Sutton. Everyone approved, motion passed. Looking forward to seeing the shirts on everyone at the Eastern Classic in June. Sponsorships: Ron, Debra, and Veronica Kucinski, Diane McEntee and myself have been meeting every week for a month now on preparing sponsorships, corporate and regular. To date we have mailed out about 300. Many of the trainers and farms were mailed a show program and sponsorships. We are starting to receive checks on a daily basis now. 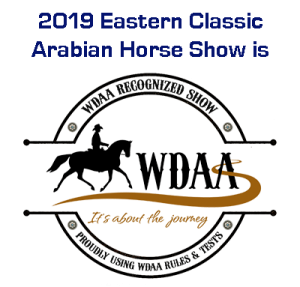 If everyone would please send back their sponsorship and check this will enable our Eastern Classic to continue growing year after year. Open Shows: The dates for the 2 shows are May 19 and June 16. It will be the same class list as in the past. Still looking for 2 volunteers for Judging. Need volunteers for various duties at the show. Anyone interested in volunteering please contact Bob at 984-3636 or bobmc36@aol.com. Any questions regarding the show please contact Maureen Quillin at Quillinltd@aol.com. Eastern Classic: We will be holding a show committee meeting at the McEntee’s on Wed. April 3, 2013 at 7:30. Anyone interested please attend this meeting. Remember without your input a few are making the decisions. Still need volunteers for the various positions at the show. Motion to adjourn by Mark Owens and second by Corky Sutton at 9:35.